These mango slices resemble peaches in appearance but have a denser (and less mealy) consistency. Lightly spiced with cloves, allspice, cinnamon, mace, and peppercorns, the vinegar and sugar mix creates a light but flavorful poaching liquid. The recipe came from Fine Preserving by Catherine Plagemann, originally written in the 1960s and later annotated by M.F.K. Fisher and republished in the 1980s. I am enjoying layering my comments on Fisher’s on top of Plagemann’s comments on recipes handed down from earlier generations (Plagemann was born in 1905.) One thing for sure: we have less tolerance for the super sweet preserves than the past, so I took the liberty of cutting the sugar by doubling the amount of mango. Next time, I’ll also cut the ratio of sugar to liquid or add more mangoes, since I had a lot of liquid left. One of the most interesting aspects of the original recipe is that it calls for whole spices that are not commonly available today, specifically blade mace and cassia buds. Blade mace is the outer hull of the nutmeg seed and is more delicate in flavor. I substituted ground mace from the bulk spice department of our local organic grocery store. Instead of the cassia bud, which was supposed to be added to the jar along with the peppercorns, I used stick cinnamon in the poaching liquid. I doubled the number of peppercorns per jar in the hope that the spice would cut the perception of sweetness. 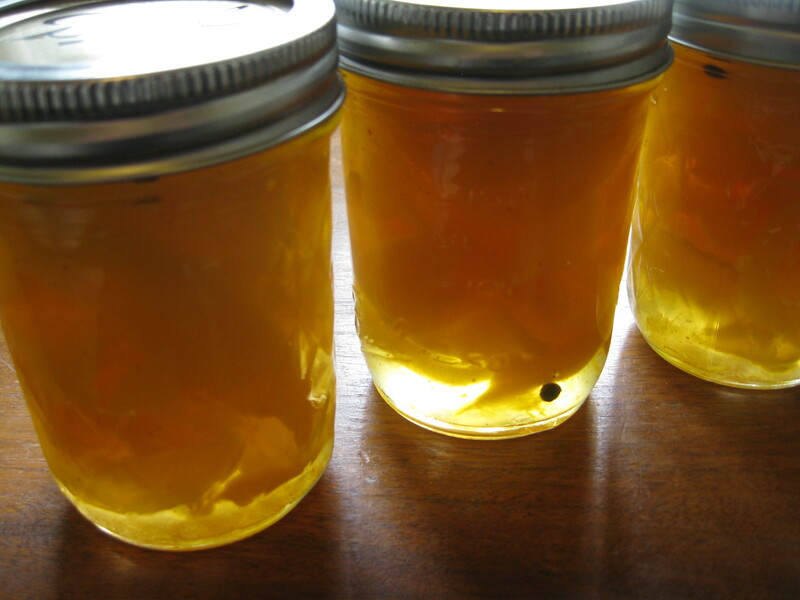 Mangoes, like peaches, expand in the jar when being canned, so don’t overstuff the jar, or some of the liquid will siphon off and possibly wreck the seal. I am going to let this cure for a month and test the flavors. If you are canning the mangoes using a water bath method, prepare the jars and the canning kettle. Prepare the mangoes by peeling them and slicing them vertically into four quarters. Pry the flesh from the pit, one quarter at a time, trying to keep as much of the flesh intact as possible. Slice them vertically into neat pieces, about 1/8-inch thick. Tie the cloves, allspice and cinnamon in a cheesecloth bag. Bring the vinegar, water and sugar to a boil on top of the stove, stirring to dissolve the sugar. Add the ground mace and the spice bag, and simmer for about 3 minutes. Add the mangoes, bring to a boil and boil lightly for 5 minutes. Remove the mango slices to prepared jars, add 4 peppercorns to each jar, and cover them with the hot liquid. Leave a good ½-inch of head space. Clean the jar rims, seal the jars and process in a water bath canner for 10 minutes after the water returns to a boil. Turn off heat, remove canner lid and let sit for 5 minutes before removing to the counter to cool undisturbed.